Dr. Orlando is an associate professor of clinical nursing at Louisiana State University Health Sciences Center New Orleans School of Nursing. 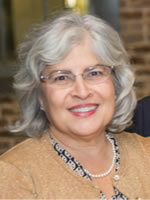 She received her Bachelor of Science in Nursing in 1974 from the University of Southwestern Louisiana. She received her Master of Science in Parent Child Nursing from the University of Colorado Health Sciences Center at Denver in 1978 and her Doctor of Nursing Science degree from Louisiana State University Health Sciences Center School of Nursing in 2007. Dr. Orlando is certified as a Neonatal Nurse Practitioner. Dr. Orlando serves as course faculty for all specialty courses in the neonatal nurse practitioner program as well as core courses in the DNP program. She serves as a faculty advisor to the neonatal nurse practitioner students. Dr. Orlando has clinical experience in neonatal nursing as a clinical nurse specialist and neonatal nurse practitioner and then as the NICU Unit Director at Ochsner Foundation Hospital. Dr. Orlando is a member of the Sigma Theta Tau International Honor Society of Nursing, the National Association of Neonatal Nurse Practitioners, the Association of Women Health and Obstetric and Neonatal Nursing, the Academy of Neonatal Nursing, and the National Association of Neonatal Nurses. She also serves as an item writer for National Certification Corporation on the Neonatal/Pediatric Transport Certification Exam content team. Dr. Orlando has received multiple honors throughout her career including being the recipient of the Daisy Faculty Award, Sigma Theta Tau Epsilon Nu Distinguished Graduate Award, F.A. Davis Excellence in Writing Award, New Orleans District Nurses Association Great 100 Nurses, Ochsner Foundation Hospital Excellence in Nursing Award: Perinatal Grief Support Team, Excellence in Nursing Award: Neonatal Transport Team and Univeristy of Southwestern Louisiana College of Nursing Outstanding Student Nurse of the Year Award. Orlando, S. (2014). An overview of clinical tools used to assess neonatal abstinence syndrome. The Journal of Perinatal and Neonatal Nursing, 28(3), 1-8. Orlando, S., Danna, D., Giarratano, G., et al. (2010). Perinatal considerations in the hospital disaster management process. JOGNN, 39(4), 480-488. Giarratano, G., Sterling, Y., Orlando, S., et al. (2010). Targeting prenatal emergency preparedness through childbirth education. JOGNN, 39(4), 468-479. Orlando, S., Bernard, M., & Mathews, P. (2008). Neonatal nursing care issues following a natural disaster: Lessons learned from the Katrina experience. The Journal of Perinatal and Neonatal Nursing, 22(2), 147-153. Giarratano, G., Orlando, S., & Savage, J. (2008). Perinatal nursing in uncertain times: the Katrina effect. MCN: The American Journal of Maternal Child Nursing, 33(4), 249-257. Orlando, S. (1995). The immunologic significance of breast milk. JOGNN, 24, 678-683. Orlando, S. (2012). Pathophysiology of acute respiratory distress. In D. Fraser, (Ed). Acute respiratory care of the neonate, 3rd ed. NICU Ink Book Publishers. Pressler, J., Orlando, S., & McGrath, J. (2010). Interdisciplinary competency validation. In C. Kenner & J. McGrath (Eds. ), Developmental care of newborns and infants: A guide for health professionals, 2nd ed., (pp. 515-539). Glenview, IL: National Association of Neonatal Nurses. Orlando, S. (1997). Pathophysiology of acute respiratory distress. In D. Askin (Ed. ), Acute respiratory care of the neonate, 2nd ed. NICU INK Book Publishers. Orlando, S. (1991). Pathophysiology of acute respiratory distress. In J. Nugent (Ed. ), Acute respiratory care of the neonate. NICU INK Book Publishers.